This long interview with Toyama Yuuichi and Yokoo Kenichi first appeared in Shooting Gameside #1. To my knowledge it is the only available interview with them that focuses on Soukyuugurentai and the Mahou Daisakusen series of games. 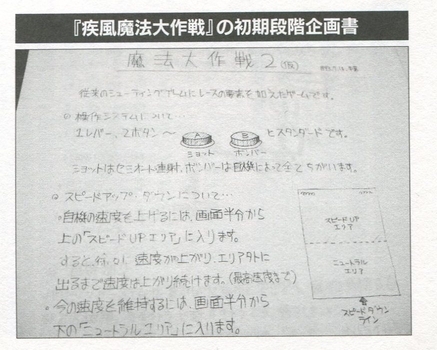 In addition, I’ve also translated some of the concept art that was featured in the article. I’ve appended it to the bottom of the interview. —Of all the games you’ve developed so far, what are your favorites? Toyama: For consoles, Spriggan Mark 2. For arcade, Soukyuugurentai. Yokoo: The first arcade game I worked on, Mahou Daisakusen, and also Soukyuugurentai, which was a very difficult project that we somehow managed to pull together. And although it wasn’t an arcade game, I feel like we managed to create an arcade style console game with Kururin Squash! (Gamecube), which I also really like. —What games or other things led you to have an interest in game development? Also, please tell us a bit about your childhood. Yokoo: When I was in my 5th year of elementary school, Pacman was really popular, but none of the places that had it allowed children to enter so it was closed off to me. So I made a board game version of Pacman in my notebook that I played with my friends, and we all started making original board games in class. Making board games like that isn’t anything serious, but I think it was the first time I experienced the pleasure of seeing other people enjoy something I had created. In high school I would draw pictures, put together models, and play games… I was a pretty clueless nerd, but when I look back its mysterious how all those things are a real part of my work today. Especially with models, where I was wracking my brain trying to make this plastic, 10 inch figure look like the real thing, I feel there’s a lot of similarity between that and games, where you’re trying to create a realistic world. —Toyama, are there any personal computers you had a particular attachment to? Toyama: If I had to say, probably the first model MSX. At the time Microsoft and ASCII were waving the flag declaring that this was the first computer with a “unified standard for home computers,” and that really made me dream about what could be possible if the home computer wars were over. Ads were published in every newspaper announcing the MSX, and I was so excited about it that I had them posted on the wall in my room for quite awhile. —If you had to list your three favorite games, what would they be? Toyama: Zanac (Famicom), Colony Wars (Playstation), and Soviet Strike (Playstation). Yokoo: Musha Aleste (Megadrive), Pilotwings 64 (N64), and Geometry Wars 2 (X360), I’d say. Though if I could I’d list three titles for each system. —If you have any memories of when you met, please share them with us. Toyama: I think Yokoo joined Compile in the spring of 1991, but we had a lot of people join then, like Matsuoka, currently of M2, and many other intense personalites, so I’m sorry to say I don’t really remember Yokoo joining. (apologizes) After that, though, Yokoo distinguished himself as an excellent pixel art designer. After leaving Compile, together with Kazuyuki Nakashima we all joined Raizing to make arcade games. —In 1993 Eighting and Raizing were established. What was the relationship between the two companies? Toyama: The development was done by Raizing, while sales and distribution were done by Eighting. There wasn’t any special meaning beyond that I think. —Did you have a design philosophy in mind with regard to developing arcade shooting games? Toyama: We only had experience devolping console games and were now in the position of starting an arcade game development company, so if we had any design philosophy, it was probably just to experiment and try out everything we could. —What made you choose a sword and sorcery fantasy world as the setting for a shooting game in Mahou Daisakusen? Yokoo: In the beginning it was titled Haougekiden Saifuaa 2 and was planned around a Chinese martial arts theme, but some staff from Toaplan gave us some advice that “shooting games should have worldwide appeal,” so in order to attract more players we revised the game, and Mahou Daisakusen was the result. Also, by 1993, the writing was already on the wall that if you were going to design a successful shooting game, it needed to be something a person of any skill level could enjoy. So we changed the world of the game with the goal of making it inviting to the large number of players who were into console RPGs. As for the powerup system, we intentionally followed Musha Aleste on that. —With a fantasy world as the basic setting, what made you add steampunk elements, ninjas, and other such things? Yokoo: Although we had a sword and sorcery motif for the reasons above, in order to make such things like the player’s shot and the explosions more flashy, we added mecha elements to the design. To increase the fun players have destroying things, I would say rather than steampunk per se, we were aiming for a world redolent with the smell of steel and gasoline. As for the ninjas and samurai, as usual Wizardy was an influence, but basically we just wanted to present players with something cool and surprising. Also, the reason our ship designs had hand-like protrusions was that we wanted to add more personality and character to our ships, but we thought if we used human figures the hit box would be hard to understand and interfere with the game. With that in mind, the ship design was an experiment to see if we could make the operation of the ship and a sense of personality coexist together. The Samurai Dragon Miyamoto character was also a sort of test to see how players would receive a ship completely in human form. The Mahou Daisakusen manga… read it here! —Please tell us how the four heroes, Gain, Chitta, Miyamoto, and Bonham came to be created. Chitta was supposed to be a natural magic girl from a rural village, and this was basically done for the effect of what we would call “moe” today. Later we made her do things like an idol concert, but… it seemed it really didn’t have the effect we were hoping for. As for her name, at the time our offices were located in Kamada, and we thought the neighboring Kawasaki “Cinechitta” movie theatre had a cute ring to it. Toyama: Even in a shooting game, we wanted to emphasize a strong sense of character and story, so at the beginning and end of stages we made the characters speak some dialogue. The one I remember is the 4th character, who said “I like bones,” so we named him Bonham. It was also a reference to a zombie character in the first part of the manga Jojo’s Bizarre Adventure, which I believe itself was a reference by the author Hirohiko Araki to the drummer of Led Zeppelin, John Bonham. —Please also share with us how enemies such as Bashinet, the Great Gobligan King, and Tsumujimaru were created. Yokoo: As for the Gobligan King… in the typical “white man’s burden” story, a man is expelled from his homeland and ends up leading a group of uncivilized natives, but here we had the idea of the Goblins making him their leader in the hopes that his strength would make them into a powerful army. With this kind of story, we thought that if a normal human was going to be the last boss he would have to have some kind of powerful charisma, and to express that idea we thought “charisma comes from the face.” And that’s how we ended up having the last boss be a giant face that covers the whole screen. Bashinet was a continuation of the rival ship “Daia 51” from Musha, but this time we thought since he’s a rival, he should be red. We tried to make him look like a Ferrari when we created the pixel art. Basically, we had the idea that everytime he showed up he would be equipped with stronger weapons which would surprise the players. I think at that time, as we filled out the details of the game world, we kept trying to push more and more ideas into the game that would excite and surprise the players in a fun way. People always end up playing stage 1 over and over, so we made the goblin soldiers in the background be always doing something, so that players could feel like they were always discovering something new. We added a lot of little details like that. For Tsumujimaru, we thought it would surprise players if, all of a sudden at the end of this boss rush with huge bosses, a tiny little boss comes out. And we thought it would be really cool if he was extremely strong. Also, at the time versus fighting games were gaining a lot of popularity, and I personally wanted to try creating an action game type character. Armed Police Batrider concept art: Adam’s bike. —Gain, Chitta, Bonham, and Miyamoto show up in Battle Garegga and Armed Police Batrider as guest characters. Please tell us the story of how they became the “all-star characters” who would return in so many of your games. Yokoo: Regarding the guest characters, they didn’t originate from any kind of explicit plan–it was the result of the programmers rushing ahead. The truth is that the programmers for Battle Garegga were very fast and went ahead without waiting for the graphics to be done and reused data from previous games. At the time we were using the same pcb hardware so it was easy to reuse the data like this. Also, as we made new games the hardware memory increased so we went and added more characters. The hidden command to unlock characters started with Battle Garegga. But you know, having an “all-star” cast and doing crossovers like that was fun in and of itself, so after Garegga we reused the idea in order not to disrupt the world we had created. So that was part of it too. Originally, Musha Aleste, Seishi Senshi Spriggan, and Spriggan Mark 2 all felt like they were part of the same chronicle, so there’s a connection there too. And we thought that even if there isn’t a story that’s talked about in the game, and even if there are no connections between the plots, by putting little details into the games that link them together, we hoped to inspire all kind of fanciful ideas in the player’s minds. We also had other guest characters we had initially planned to add to Dimahoo, which for one reason or another didn’t come to pass. We wanted to have Yashida Kaoru from Soukyuugurentai as a martial artist, and some kind of beast man that would suggest characters from Bloody Roar, and a dwarf character whose ship would be based off a motif from Battle Garegga. At first we had planned to make 70 year old versions of Gain and Chitta, too, called “Old Man Gain” and “Granny Chitta,” but we thought that expanding the world in that way wouldn’t make players happy, so we scrapped it. Also, we wanted to include guest characters other than those from the original Mahou Daisakusen, so in the end we added Golden, who was a favorite of the development staff at the time. —Why did you add a racing element to Shippu Mahou Daisakusen? Toyama: In general, shooting games are designed so that the better you are, the longer you get to play…but we thought, isn’t this a problem for game centers, and how could we make a game where the better you were, the shorter the game was? So we tried adding a racing element. There was also some influence from the Megadrive game Road Rash, which people were playing at the development office at that time. Yokoo: Mahou Daisakusen was an orthodox shooting game, so we thought this time we’d try something a little different by adding the racing element. —Shippu Mahou Daisakusen also has multiple endings depending on where you place in the race, and it has divergent stage paths in the race courses. Please tell us about how these design elements came about. Toyama: As you can imagine, we wanted people to play our games over and over… we were aiming for a high income for the game centers. Though I don’t think the game made that much, unfortunately. —Please tell us how the elemental system and the treasure collecting came to be in Dimahoo. Toyama: Since just clearing a game is easy, we wanted a system where you would have to use the elements to get a high score and it would therefore become more difficult. At the time, Treasure was developing Ikaruga, which also featured a black/white element system, and since our development periods overlapped, I sensed we were both paying close attention to any pre-release news of each others’ games. Our approaches to an element system were different, but I think Ikaruga was better received by players. THE EARTH WAS REALLY HOLLOW! That was also the intention behind having the bombs trail behind each ship and be exchangeable between players, so they could help each other. As for the treasure collecting, that actually wasn’t in the initial design plans. If I recall, during development, while testing how to display items we flooded the screen with them, and it looked good. Then someone said “I want to collect more of these items!”, and to that end we implemented the treasure system. I remember we were also thinking about how it was fun in older games looking for secrets, and were wondering how we could use idea that as a feature of a modern game. Also, since this was a joint project with Capcom, we were able to put Mobi-chan and Yashichi in there as treasure items. —Six years passed from the release of Shippu Mahou Daisakusen in 1994 to Dimahoo in 2000. What was the occasion for developing Dimahoo at that time? Toyama: Capcom was talking with different shooting game developers about doing a shooting game for their CPSII hardware, so we started planning Dimahoo. It was the last shooting game I programmed. Yokoo: Mahou Daisakusen was an orthodox shooter, then we did Shippu Mahou Daisakusen which was a little different, so here we wanted to return to a basic shooting game which would act like a compilation of the Mahou Daisakusen world. 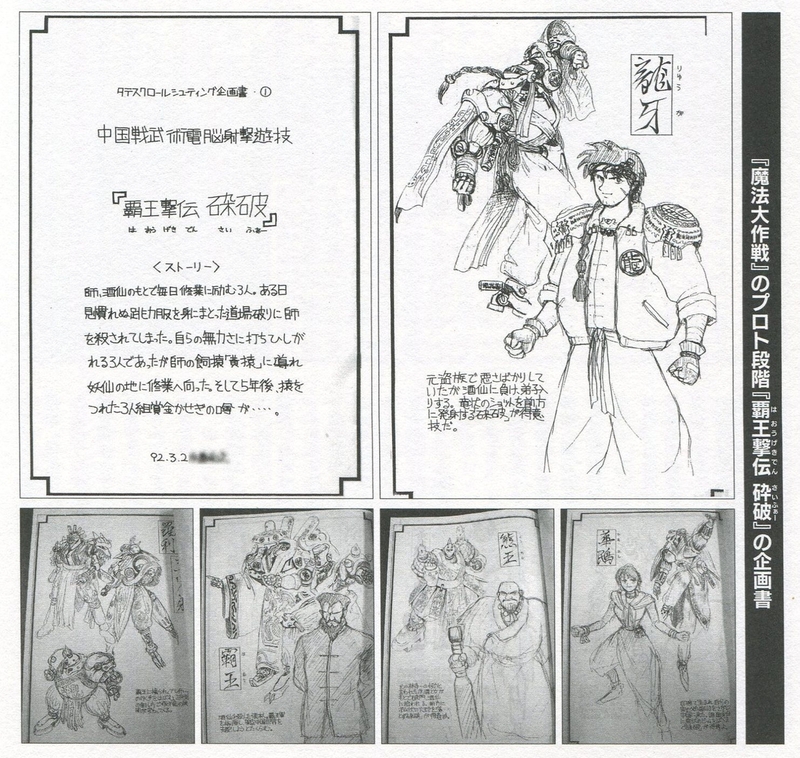 While we were thinking about such a sequel, we had a series of talks with Capcom, and we were able to realize the release of Dimahoo, which would retain the style of Mahou Daisakusen while also being “powered up.” It wasn’t a remake… we intended to make something more analogous to the relationship between Terminator and Terminator 2–an upgraded version of the same theme. The way bomb items were collected was also based on Battle Garegga; we wanted to include things like that which would feel like references to our other games. —The Mahou Daisakusen series is said to be difficult for the general player, but were there any points you struggled with while setting the difficulty level? Toyama: Personally, we didn’t think they were that hard, but… I mean, especially when you compare them to Battle Garegga, aren’t they rather easy? Yokoo: We recognized that if you were simply trying to clear them, they were relatively easy when compared with other arcade games of the time. You could bomb spam through a lot of parts, after all. But at the times versus fighting games were all the rage, and it was extremely difficult for shooting games to draw income at game centers. We had intended to make them easier, if not for that. —Please share any interesting anecdotes, memories, or struggles you had while developing the three Mahou Daisakusen games. Mahou Daisakusen 1cc by Ruldra. Yokoo: Deciding on the Mahou Daisakusen name definitely caused us all sorts of problems. At first we had the name “Mahou Daisensou” 5 , but Irem had just released “Kaitei Daisensou” (In the Hunt) before us. There were many ideas until we came up with the name we have today. The whole staff was racking our brains to come up with ideas every day, and from a total of 108 suggestions we chose “Mahou Daisakusen.” The imagery we saw in some of the ideas like “Magic Cop” and “Magic Detective” were influential in the setting of Batrider… maybe. I also remember the flyer for the overseas version of Mahou Daisakusen, where I drew the character illustrations in the American comic book style. But this wasn’t requested by our staff; I just used something I had drawn for myself for fun. It was a laid back time to be making games. Toyama: Mahou Daisakusen was Raizing’s first game, so we recieved various advice from Toaplan staff at the time. I think they taught us about the difference between arcade and console games, and how to approach making games that would be profitable at game centers. —Was there any other advice you received from Toaplan staff? Yokoo: They also told us things like “Shooting games are about the journey, not the destination, so boss battles should simply be a bonus extra. They don’t have to be incredibly difficult to be fun.” It was different from our thinking in a number of ways, but those words taught us the value of interesting zako fights, and in that respect we incorporated their advice into our games. 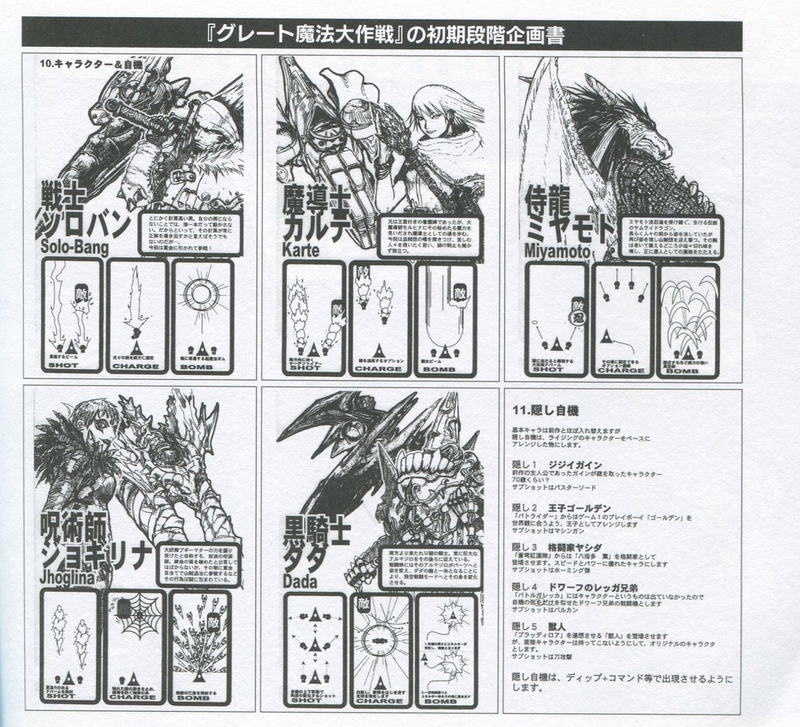 —Did you have any special designs for the sound and music of the Mahou Daisakusen series? —Please share any memories you have of the development regarding Atsuhiro Motoyama, who handled the sound and music for Mahou Daisakusen and Dimahoo. Toyama: I didn’t deal with any of Motoyama’s requests regarding the music composition; I only oversaw his work on the sound effects. I personally consider myself something of an anime otaku, but Motoyama was a real maniac, and whenever we’d talk about sound effects he’d make some anime reference or comparison. —Starting with Mahou Daisakusen, the kanji “hira” has been selectable in the name entry screen. What was the reason for that? Yokoo: Yeah, it was all in the spirit of fun, a sort of signature for us at Raizing to show that we had come from Compile and Musha Aleste. For Dimahoo the character “yuki” also appears, which referred to two of our designers who had “yuki” in their names, and was another instance of us joking around. —Regarding Soukyuugurentai, please tell us about any difficulties you had constructing the world. Also, how did you come up with the idea to feature the Japanese Mincho font so prominently? Toyama: I read a line in some magazine that said “Space will be easy to colonize if we just set up corporations specializing in that field.” That got me thinking, and I later came up with an idea for the title “Soukyuugurentai” that would become the prelude to the development–that is, “A rogue squadron streaking the blue sky (soukyuu) crimson (guren)…” I remember after that everything came pretty smoothly as we fleshed out the world. contributes to its unique aesthetic. Yokoo: From the outset we were aiming for a visceral quality like that of the Tokusatsu films 6 , and we wanted to make a game that would express the idea of a “media filtered reality” through news programs and such. So to those ends we planned to add the various subtitles in Japanese that you see throughout the game. The fake newspaper articles in the ending screen were added for the same reasons. The fact that the hardware we were using had an expanded rom size allowing us to include large Japanese fonts was also a main factor. We had been wanting to do something like that in a game for awhile and were very happy about it, but when it came time to be released, we received a lot of feedback from people saying that it resembled Neon Genesis Evangelion. Of course we watched TV, but during the development we really hadn’t had time to watch things and be influenced like that, I think. Rather, I think our influences were from the older show “Toppu wo Nerae!” (also by Gainax) and the Tokusatsu film “Gamera“. —How did you come up with the three players’ names? As for Mikazuki Ryouta, at the time there was a house called Mikazuki near our office, and each time I passed by and looked at the sign I thought, “what a cool name,” so I just decided to use it. Kunimura Rika was a little different from what I said above, in that her character differed from the other two. She was from a different department at Jinsei Corp., among other things, so we wanted give her a different feel and decided to use a simple surname combined with a slightly odd first name. Her ship’s name is different too; while “Toryu” (Dragon Slayer) and “Shiden” (Purple Lightning) are named after old Japanese army aircraft, her ship “Houga” (Phoenix Fang) was our original creation. —Please tell us the history of the development of N.A.L.S. (Non-blind spot All range Laser System)? The NALS system in action. Yokoo: I oversaw the scoring system and the enemy placement for Soukyuugurentai. The web lock-on system was done with the goal of making a vertical scrolling game on a horizontal screen enjoyable. The STV arcade hardware was the same hardware for the Sega Saturn, so we thought it would be best if the game could be easily played both at home and at a game center, so we went with a vertizontal game. We thought the web lock-on system did a good job of both covering the wide horizontal screen area and also preserving the fun feeling of shooting. As for the scoring, that came from my idea that the enjoyment of destroying enemy craft and the method of increasing one’s score shouldn’t be separated. Also, I didn’t like it when shooting games became completely like puzzle games, so I adjusted the scoring system to allow for a feeling of improvisation. —Please share any interesting anecdotes, memories, or struggles you had while developing the three Soukyuugurentai. Toyama: At the beginning of development, we were planning to make Soukyuugurentai a full-polygon game where the player could press a button to switch between a normal top-down 2D view and a first-person 3D view at will. However, due to hardware limitations and problems with our programming skills, we concluded it would be too difficult and decided on the top-down 2D view only. We were developing for the ST-V hardware, but during development the Playstation version of Raystorm came out, and I remember being shocked at how good the 3D was there, and feeling there was no way we could match it. Yokoo: A week before the deadline for completion, I was suddenly told to create a name for the NALS system. So even now when I see that name I break into a cold sweat. Also, literally 5 minutes before presenting the name, Toyama said to me “this looks too similar to NERV“, but since I had no time we ended up keeping it as it was. —Does the story of Soukyuugurentai have any connections to your other games? Yokoo: Not in the story, but there is a connection to some of the elements in Batrider. Its not an obvious reference, but the things like the high altitude island Zenovia and the corporation dominated world came from Soukyuugurentai. We thought things like this would expand the world of our games, and we wanted a world where players’ imaginations could run wild even when they weren’t playing the game. —Regarding the Playstation and Saturn ports of Soukyuugurentai, please share any interesting stories or struggles. Toyama: For the Saturn port we fixed the bugs from arcade version, so we want players to play that version… but then again, it also has hardware problems, so in the end its up to the player to choose. I also fondly remember that, at the time, the Internet was rapidly expanding, and so we wrote the “Soukyuugurentai Dictionary” in HTML and included it on the Saturn disc. We also included the music on the disc in CD-A format, just because we had extra space, and I’m thankful to all the people involved who allowed us to do that. As for the Playstation version, it was directed by Data East’s development company OUTBACK, who handled their console ports, so we didn’t have much involvement with it. But I do like the short CG movies they made in between stages, which added ambience to the game. Yokoo: The Saturn version had a “Special Settings” menu where once either a certain number of points were earned or an amount of time had passed, you could change various game settings to make clearing the game easier. Its not particularly uncommon today, but at the time being able to have fun unlocking options like that was something new in and of itself, and I don’t think any other games had such a feature. Actually, there was a lot of debate over that menu, and after about a week we decided on keeping almost everything adjustable as you see it today. As for the Playstation version, we basically left it up to the company porting it, but I did handle the design of the additional character “Tetsuo Shimoniida.” I do clearly remember being asked by Data East to make the character’s name sound like a “tough old man, Data East style”, but because the setting and the world were already decided, I couldn’t really do it. —In the trading figure series “Shooting Figure Historical SP3” you made a model of the “S.O.Q.-004 Toryu” ship from Soukyuugurentai, but in addition to the normal red color, you added a secret light blue color. What was the idea behind that? Yokoo: That was the Toryu operated by Mikazuki Ryouta. We had talked a lot abot “Soukyuugurentai 2,” and one of the ideas we had involved Mikazuki Ryouta as the protaganist, where he takes over Yashida Kaoru’s Toryu after she quits the Jinsei Heavy Industry Company as shown in the ending of Soukyuugurentai. When TakaraTomy Arts asked us what color would be good for a secret color version model, we first talked about doing a test prototype ship, but we realized there actually was a blue Toryu in the world of the game, so we added it as Ryouta’s personal color model Toryu. —That explanation wasn’t in the manual for the model! Yokoo: That’s right. There were things we didn’t make public even though they were part of the game world. We figured it would be nice for people to be able to use their own imagination for some things. The light blue model Toryu ship, as described above. —Please tell us a bit about Soukyuugurentai’s sound and music design. Toyama: There are many parts that have Sakimoto’s personal touches. He worked hard to make the stage progression match the music progression, and to make the music sync with what was happening onscreen. I thought it was remarkable, like the music for the part in the third stage, when you can see the “Donryuu” boss through a break in the clouds. Sakimoto also seemed to love science fiction and space stuff. At the time when I went into his room he had posters of space shuttle launches hanging on the wall, and I think he loved NASA as well. When I came to him and asked him to do the sound for Soukyuugurentai, the first thing he said to me was “I’ve been waiting to do science fiction! I’ve been dying to do something like this!” And about a year or so ago, at the game music live event “EXTRA”, Basiscape performed songs from Soukyuugurentai, which was a great honor to us. —Please tell us about any memories or interesting episodes regarding other Raizing titles. Toyama: When we ported Battle Garegga to the Sega Saturn, we asked Matsuo Hayato, Hitoshi Sakimoto, Shinji Hosoe, and Masaharu Iwata to do an arrange remix of the music. Hitoshi Sakimoto did the arrange version for the 3rd stage. When we received his mixdown, Manabu Namiki was listening to it on headphones when I saw him suddenly fall over laughing. Apparently, about 30 seconds after Hitoshi’s remix began, as a joke he had inserted a loop of himself screaming NAMIKI!!!!! It was absolutely hilarious to everyone there. —Please tell us about any memorable episodes involving Koyano Kenichi, who oversaw the sound development of Armed Police Batrider and Dimahoo. —What is a shooting game to you? Toyama: When we were making our games I thought of STGs as war or battle simulators, so we tried not to make them rely too strongly on pattern memorization, but rather tried to always have an element of randomness in them. That is just my personal preference; I’m not trying to criticize the fun people can have with pattern memorization games or anything. Yokoo: To me a STG is basically a game system that anyone can pick up and play for a short period as a way to relax and unwind, and should take about 30 minutes to clear one loop. The story should let players be drawn into and feel the world in the same way as an emaki monogatari 8 . And STGs should give a sense of accomplishment and be easy to play and easy to understand. I personally love STGs and would like to see a return to the time when many people of all ages, men and women both, were able to enjoy these games. —Please give a final message to the fans of Raizing and Eighting’s games. Toyama: Even though we aren’t releasing shooting games at Eighting currently, we have the deepest gratitude to all the fans of our past games, as well as the game centers that hosted our games. Although Eighting is mainly developing fighting games and action games now, there are many on our staff who love shooting games, and given the chance we would love to develop more of them someday. Yokoo: It’s been 18 years since we made Mahou Daisakusen. So much time has passed since I was a boy, and I can’t begin to express how much gratitude I have for your doing a feature like this on our games. I can’t say we were ever a major game company, but it is the encouragement and support from our fans that has made us what we are today. In the last few years we have beeen working as a developer, so we haven’t had much chance to put our names on our games, but our effort and dedication to creating an enjoyable experience for players has not changed. If you have the chance, please try the various games we’ve made recently. And thank you very, very much. Below are the most text content heavy design documents featured in the interview. I am too lazy to scanlate these, but they are fairly simple and should be easy to follow along with from the notes below. My comments will be in red. A former brigand who only knew a life of crime, he loses a fight to Master Shuzan and becomes his pupil. His dragon form shot that fires in front is his special ability. The bottom left character is under the control of “Haou,” the main antagonist, and is probably a boss in the game. The next character is “Haou” himself who killed Master Shuzan and is building the “Haou Army” and is planning to take over the world. Interestingly, his name “Haou” is spelled with different kanji from the “haou” in the title which means dynasty. So there is some typically Japanese wordplay going on in the title here. The third from left character was an acolyte at a temple, but due to women and booze he got thrown out. Master Shuzan takes him in. He sounds like a player character; there’s some line about his bomb that I can’t fully make out. The last girl character I unfortunately can’t read anything clearly enough to say. I think it says something about her coming to China to search for her father, but can’t make out the other details. 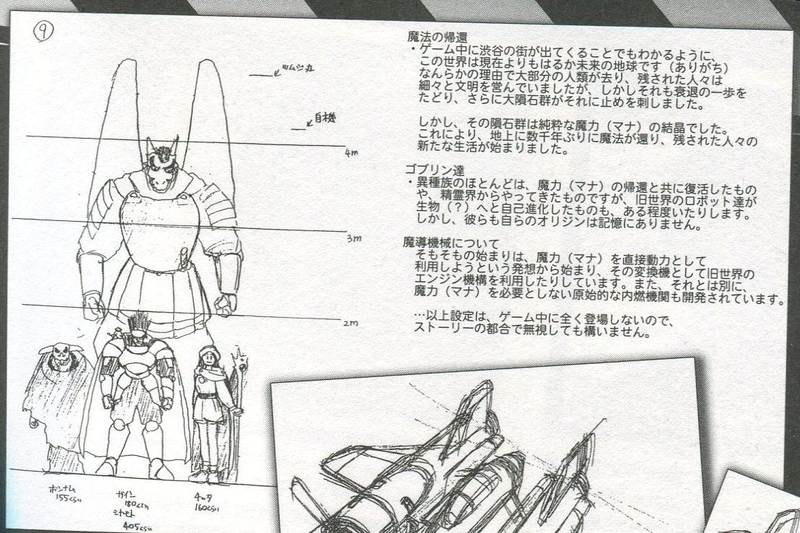 In picture, top line points to Tsumujimaru’s height, and the one below it points to the height of the player’s ship. The world takes place far into the future of Earth, which one can tell as soon as the town of Shibuya appears on screen. For some reason the majority of the human population is gone, and the remaining humans just barely manage to continue civilization. However, their further decline is halted by the meteorites that fell from the sky. Those meteorites were pure magical crystals (mana). With them, magic that had been dormant on the Earth for thousands of years returns, and the surviving humans begin a new life. Most of the non-human species are revived along with the return of magic (mana), or they come from the spirit world. There are also robots from the old world that have been become living (?) and self-evolved. But they don’t have any memories of their own origins. At the beginning, the ships were operated directly through magic (mana), but they are later combined with engine technology from the old world. Also, aside from this, the humans are developing a prototype internal combustion engine that doesn’t require magic (mana) to operate. …the above does not directly appear in the game at all, so it is fine to ignore the circumstances of the story. Warrior Solo-bang: A calculating man. If it isn’t to his advantage, he won’t lift a finger. But that doesn’t mean that his scheming always leads him the right way… Lured by the promise of the reward, he joins the fight! Sorceress Karte: Originally a royal princess, she chooses the path of sorcery after her hidden magic abilities are discovered by the sorceress Moruhina. Heedless of Moruhina’s advice, she hears a rumor about a group of marauding bandits and sets out to save the suffering people. Samurai Dragon Miyamoto: The legendary Samurai Dragon Miyamoto, successor to the Miyamoto Ninjutsu. He had disappeared from human civilization for a long time, but he appears once again to face the mountain bandits. Far from being weakened or aged, his blade has become even quicker, and his formidable reputation continues to grow. Witch Jhoglina: A wandering witch who claims to have inherited the power of the Great Faerie Boogie Mataa. She openly declares her mastery of alchemy, but her unexpected decision to participate in the hunt for the mountain bandits is shrouded in mystery. Dark Knight Dada: A mysterious knight hailing from the Western lands. He is always accompanied by a huge armadillo. In a fight the armadillo changes into a machine and merges with Dada, allowing him to transform into Flying Battle Mode. The main characters are basically swapped from the first game, but these are remixed versions of characters from Raizing’s other games. The protagonist from Mahou Daisakusen, now older, returns. we remake him as a prince. Subshot is machinegun. Yashida Kaoru from Soukyuugurentai appears as a martial artist. She will have excellent power and speed. Subshot is homing bullets. Since Battle Garegga didn’t have any characters, only ships, the dwarf brothers’ ship will resemble a ship from Garegga. Subshot is vulcan. A “Beastman” meant to suggest Bloody Roar, but he will be an original character, not taken directly from that game. Subshot is a blade attack. The hidden characters will be selectable by dipswitch and through a hidden input command. Standard 2 button setup. Shot is semi-automatic, bomb differs based on the ship. To increase speed you must be in the top half of the screen in the “speed up area.” By doing so your speed gradually increases. Until you leave the area it will continue to increase (up to a maximum limit. In the little picture to the right, there is a arrow pointing to the “speed down line”. * In general, stages are above the earth or in the earth’s orbit. No absurd or fantastic stages. The various handwritten notes in the 2D/3D perspectives below don’t say anything special, but pretty much describe what you see: they had planned for, or at least considered, 4 distinct views: top down, slightly angled, behind the ship, and cockpit. ｢覇王撃伝 砕破｣, which means something like Dynasty Shooting Legend – Blast! This is sort of fragmentary and vague, but I believe he’s describing something like Life Force, in which the enemy layout is clearly pre-arranged for 2P, with the added “elemental” system of Dimahoo meaning that players would each have a role to play using different shot affinities as appropriate. When you consider the way ice/fire enemies often appear simultaneously in pairs, it makes sense! This requires some explanation as it relates to the kanji characters. The original name Mariko Yashida from X-men is spelled in a typical way (矢志田 真理子) and does not mean “8 fingered mutant.” The characters for Yashida that Raizing invented (八指多) however, does literally mean “8 fingers more.” So I think they also thought it was cool the way that their reference to Mariko Yashida in X-men, who was NOT a mutant in the Marvel story, actually became more “mutant like” in their game.